Some months ago my car radio, intermittent for some time, stopped working altogether. I could get a static laden AM signal but no FM. I don't drive a lot and didn't especially miss it but a couple of weeks ago I discovered the aerial was missing. Replacing it was simple and now I can listen to clear a clear AM signal and a slightly crackly FM. Music in the car is frustrating unless I know it well. I drive a Peugeot, not a Rolls Royce, and the lower frequencies are lost in engine noise and tyre rumble so I have to fill in the bass lines myself. For this reason I listen to talk radio in preference and if I'm driving to a 9 o'clock start this means the news. I oscillate between Radio Brain - serious items about the economy, a dying eco-system and politicians on the make - and Radio Bloke - sport and stories about celebrities I've barely heard of. I have long felt that our obsession, in the UK at least, with 'celebrities' does nothing for our economic plight. Reality TV ( Big Brother being a prime example) and karaoke programmes, like the recent 'search' for a Dorothy to be the star of a West End staging of The Wizard of Oz, give hope to a whole generation of people whose sole game plan is to become famous and then rich off the back of that fame. Why bother working hard at school when, with a little make-up and the talent you know you have in spades, you can sing your way to success. And if you can't sing, well, just being witty and pretty ought to be enough. Let sociologists worry about the devaluation of celebrity status that comes with there being so many celebs. Wednesday saw the end of a project in a seaside primary school that has gone on for some months. The sun shone and the outdoor play was, somewhat against the odds it must be admitted, a great success withessed by many smiling parents whose behaviour was a credit to their offspring. Afterwards there was to be a steel band from a local high school. Instead we were treated to a small group of girls taking it in turns to sing along to a backing track. Now there is nothing wrong in that. 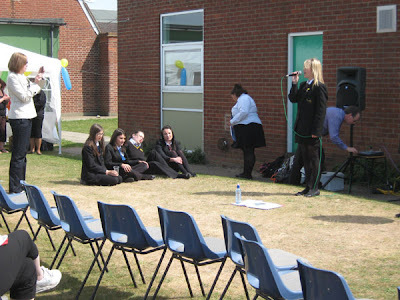 They had lovely voices and it was very good of them to come and enhance the event. But this isn't an extra-curricular activity. They do this as part of a course of study. I used to think it was just the high school where I teach woodwind that took performing arts just a little too seriously but it seems to be endemic. You can't really blame the TV companies. Programmes about plumbing and engineering that appeal to the young? The X-Factory? Charisma transplants for nerdy inventors? My glove is on the floor if anyone would like to pick it up. But perhaps I'm just failing to adapt to changing times and a day will come when we are all celebrated, as Andy Warhol predicted. Still, I can't help wondering who will be left to build, manufacture, repair or even grow anything. Will anyone still know how? In the post before last I talked about writing songs with children that are to be played by children. In this instance the children are aged between 7 and 11 years old. The words were extracted from the children by a writer, of poetry rather than songs, as part of a project aimed at improving literacy. It was my task to set this words to music with the undertaking that I should not alter the words of the children. 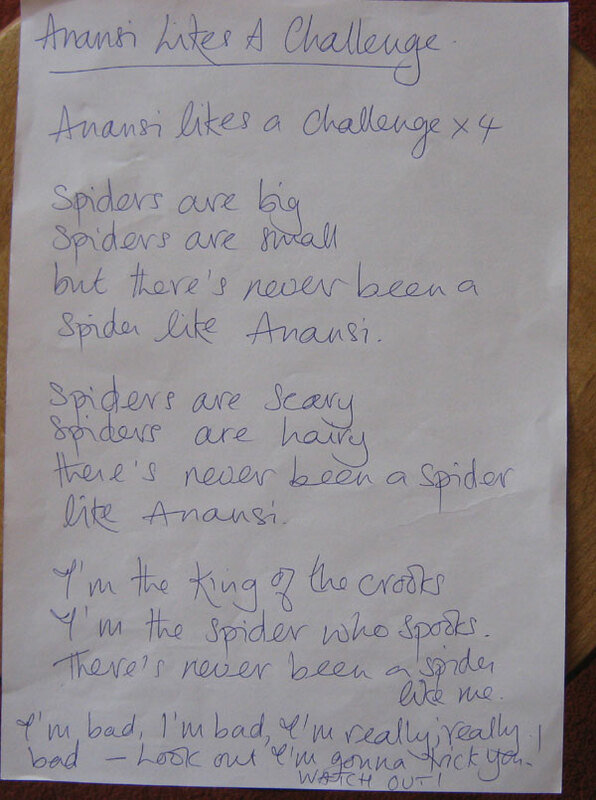 My first attempt, Anansi Likes a Challenge, is appended to the previous post. While I was pleased to have squeezed in all the words, I was concerned that it would not be an easy song for a vocalist to deliver. 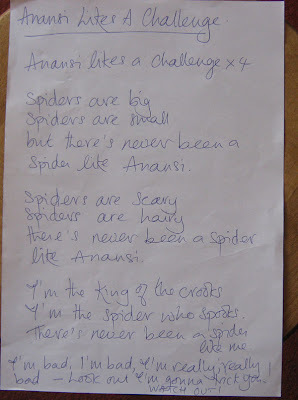 This has proved to be the case as, in the interests of fairness, and of not overburdening young minds with too many lines to learn, the part of Anansi is played by no fewer than five children, four of whom sing the song in unison. Many subsequent lyrics arrived in blank verse with lines of irregular length and no implied pulse. Some I sent back to the overworked playwright and others I tampered with myself, not just to make them role off the tongue but to make them easier to remember. (I don't know about you, gentle reader, but I like my singers to have the words in their heads rather than on pieces of paper.) I did, however, try to remain true to the ideas and images produced by the children. In rehearsal the biggest challenge was moving from one section to another. As the show is to be performed outside, and because the school has several large xylophones and glockenspiels, I opted for mallet percussion as the mainstay of the accompaniment. The orchestra has, for the most part, got the hang of changing from the verse pattern to the chorus pattern and back. However, they are still getting used to following the singer if s/he changes too early or too late. What they can't cope with is a singer who is lacks any rhythmic sensibility and is blissfully unaware of the pulse followed by the band. And, as do I, they struggle to follow a singer they can't hear. Below are two songs I demo'd up for the show. Mr Lonely will be sung by two children, as the character who plays its singer feels the need for some support. Potion Hunters' Song is sung by most of the children in Year 3 (aged 7 and 8) and uses just three notes, two of which are C, throughout the piece. It's not every day I'm asked to play in a 14th century vaulted stone crypt. 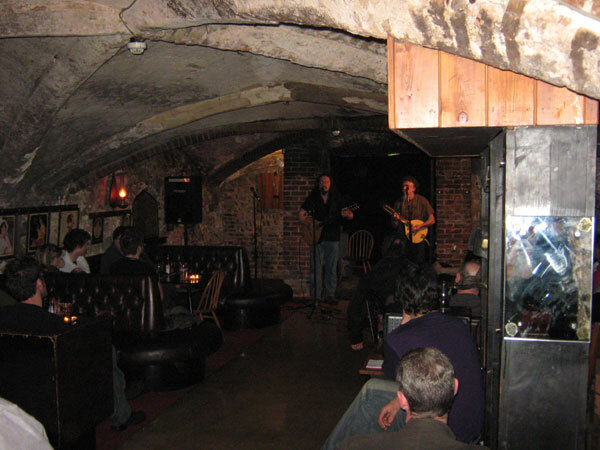 Every so often I play in the a bar called Jurnets, situated in the cellar beneath Jurnets House in King Street in mediaevel Norwich. Last Friday I did this in my role as clarinetist in Eastern Straynotes and actually remembered to take my camera along. 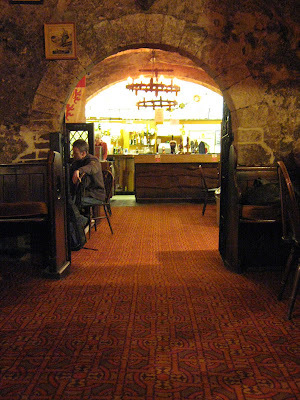 The place was 'themed' before the theme-ing of pubs became big business and has a few bits of old agricultural ironware hanging from the walls, a heavy, metal door that looks like it belongs inside a submarine, and some stuffed animals in glass-fronted boxes. There are also some light fittings, visible in one of the pictures, that I'm sure mediaeval folk would have admired. They are made of some thin metal plate and pot-rivetted together but to the casual eye they look the part. To be honest, the building itself has so much character that all attempts to add it to it are superfluous. I'm not sure who the band in the picture is. I arrived while they were playing and only had time for a quick 'hello' while they left the stage and the Straynotes set up. Foolishly I didn't ask anyone to get a photo of our set. Maybe next time. A project is nearing completion and that ending is being marked by an outdoor performance by the whole school next week. A play of epic proportions has been written, the content based on ideas extracted from the children, and it features no less than eight songs. The children wrote the songs too. That is to say, they wrote the words with the music being supplied by yours truly. The mainstay of the band will be the Year 6 kids who will accompany six of the songs. Prior to taking ten of them off to a mobile to play music I had spent a total of thirty minutes with each of the two classes. I didn't get much of an impression of their ability in that time. Games to develop a sense of pulse, such as passing a sound around, weren't very successful owing to the wide range of ability. The real indicator was the state of the music cupboard when I first arrived at the school. An archaeology degree comes in handy now and then and to my trained eye the various strata of dust, PE kit, books and an enormous TV on a trolley that I found in the music cupboard presented a story that didn't include much music-making. My work is more process-orientated than goal-driven. I have nothing against running, for instance, but most people find it easier once they have learned to walk. 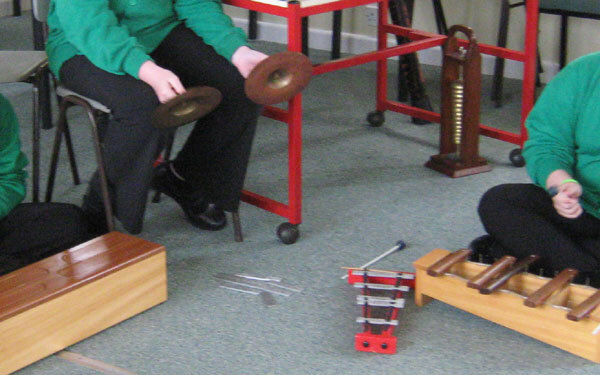 Ideally I would have liked to spend some time of rhythm and pulse with these kids before getting them playing sequences of notes on tuned percussion. I would also have liked time to explain why there is a long D bar and a short D bar on a xylophone and what flats and sharps are. We took off the bars we didn't need in any particular song which made playing them much easier. The children liked to arrange the bars in the order in which they were to be played, rather than the more conventional system of low notes to the left, higher notes to the right. Replacing the bars was more problematic and I hope I will find a solution before Friday's dress rehearsal. The alternative would have been to play every piece in the same key but I rejected this idea as both dull and a singer's nightmare. The first song I set to music was to be sung by the character Anansi, the spider man of West African folklore. Below is a demo version I made to play to the children. It was the first one I did and I was quite proud of getting all the words in, one way or another. The chord sequence is derivative but suits it well. But when it came to rehearse it we all ended up playing the root of each chord and the drummers beat out the melody rather than providing a structure. In part two I'll show how I trimmed my sails in order to create music that can be both easily sung and easily played. One of my favourite places is Norwich Puppet Theatre and I am fortunate in that my work takes me there from time to time. Not so frequently that I ever take it for granted but sufficiently often for me to feel at home. 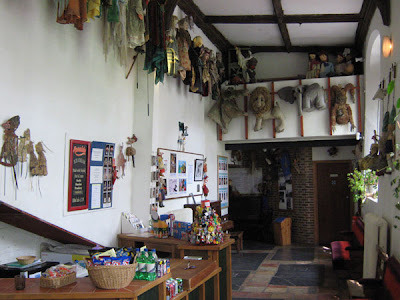 The age of the building alone, some seven hundred years or more, gives it a special atmosphere but the fact that it is a veritable museum of puppets of all kinds makes it a wonderful place to spend some time. My previous visit was at the end of March as part of Eastern Straynotes when the band was the musical element of a burlesque cabaret evening. The flamboyant, and sometimes bizarre, dress of the patrons vied for attention with the puppets looking down from above. But today it was all about the puppets themselves. 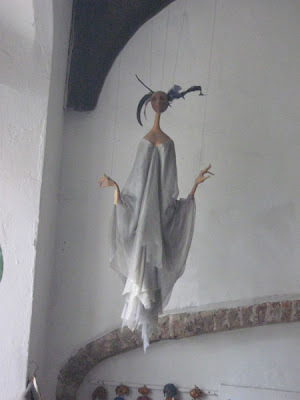 Firstly there was a meeting about the formation of a loose group of artists from different disciplines with an interest in puppets and the venue. This took place in the Octagon, a new extension added to the mediaeval building which echoes the octagonal section of the old church's tower. And the rest of the day was spent working on Garlic Theatre's new show, Little Red Robin Hood. 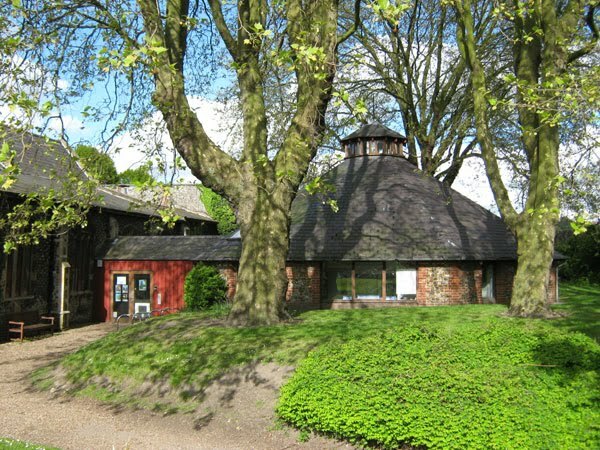 There are two performance spaces at the theatre. The main auditorium, which comprises the nave of the old church, is steeply raked and seats 185. It is narrow, having been built before our forebears acquired the knack of supporting a wide roof without the it pushing over the supporting walls. The smaller, but much more modern, Octagon Studio is an even more intimate venue with a 50 seat capacity. If I can remember I check out which room the company is using before I go down. The first time I rehearsed there was back in 2002 with Baobab Theatre. It was January, we were working in the unheated main auditorium and I froze. The Octagon is always lovely and warm but, even in July, I always bring along winter woollies if I'm to be in the auditorium. Still, one must occasionally suffer for one's art and it is a small price to pay for working in such a splendid environment. 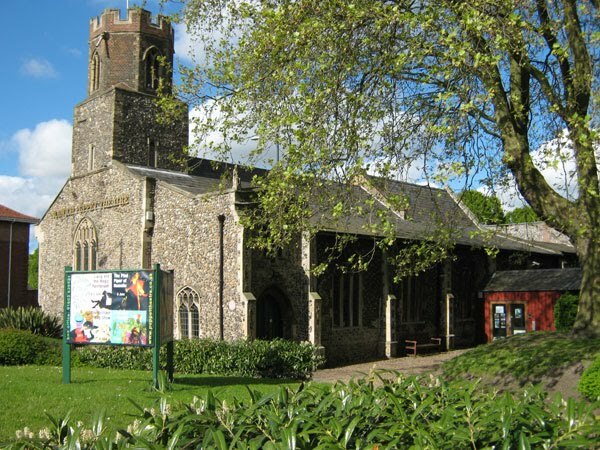 The Norfolk and Norwich Festival is here again. Every spring the denizens of this city get a taste of cosmopolitan culture and last night I went to see Les Ballets C. de la B. for a little contemporary dance. The company hails from Belgium and is famous in the contemporary dance world. 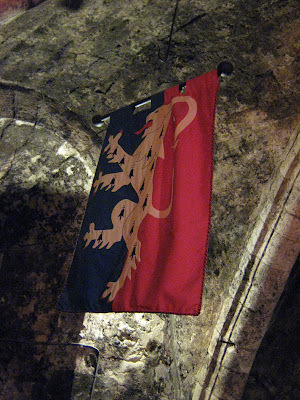 But I confess I knew nothing about them before I went, it being my partner's suggestion. The show begins tamely enough with a man walking onto the stage from the auditorium and, back to the audience, stripping to his underpants before wrapping himself in a blanket. Presently all nine dancers do the same. Now I don't think Norwich has ever staged 'Hair' but, even at the Theatre Royal, dancing in your underwear, as long as it's 'art', will not get you arrested. What I do find slightly shocking is the treatment of microphones. These are frequently dropped or dragged along the ground, while a cavernous reverb is applied to the sound. It is very effective (no pun intended) but hey, I've seen plenty of mics dropped in my time. So now I am still enjoying the dance/theatre but part of me is wondering what mics they use, how much they cost and how many shows an individual mic can handle. The show continues, perhaps it's 90 minutes long, and towards the end I see a man standing, back to the audience, making noises into a microphone while he flexes his back muscles in a manner reminiscent of of the movie 'Altered States'. But, I wonder, how is he holding the mic? Both his hands are balled into fists and he has no lapels or tie, being stripped to his trunks. And then, just as the truth dawns on me, he turns around and I realise I was right (as I hope were you). He has the thing inside his mouth while he makes the most bizarre, primordial animal noises. And then another dancer climbs up his back and squats on his shoulders as if she is riding this strange beast, like in 'Avatar'. 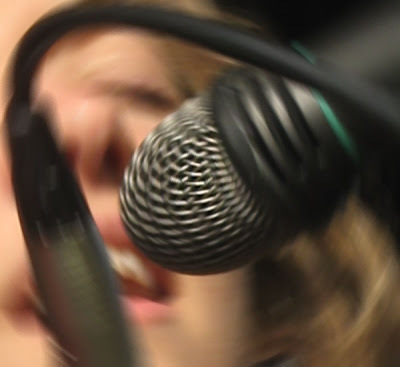 Now my head is reeling with this strange image along with the fact that this is no radio mic. It's attached to a cable which must plug into a mixer which in turn is plugged into the mains. And while I'm absorbing the health-and-safety ramifications the rider takes the mic from his mouth and she puts it in her own. The sounds she makes are just as strange but that's by they are eclipsed by what I just saw. The rest of the show is excellent, full of the humour, pathos and sheer intensity of what has gone before but now I'm wondering if I have lived too long in the sticks. Was that objectively shocking (whatever that means) or am I just too prudish and provincial? Worse, is my own mic technique just too passé and should I go for retraining? This month's free music game is played in pairs. It's called Count to Three and that's all you have to do. Except, of course, that it isn't quite as simple as that. The difficulty comes from alternating the count with your partner. To learn how to play it just click on the link to the page on my site. I first came across this game when working as musical director for Tiebreak Theatre's production of Frog in Love and readying it for its trip to the Edinburgh Fringe in 2003. David Farmer was directing the show and rehearsals always began with extended warm-ups and this was one of the games we played. I had almost forgotten it and then a drama teacher I was working with last week used the game with some primary aged children. What's great about the game is that children of six can play it as easily as adults. Or perhaps I should say with equal difficulty. This is probably a good time to mention David Farmer's book 101 Drama Games and Activities which is full of warm-ups and exercises. It contains this game but he calls it One Two Three, a name I use for an entirely different game. And thet picture, in case you are wondering, is an unusual view of Sir Norman Foster's Sainsbury Centre for the Visual Arts.